April 19 - Time to pay homage to those pungent cloves! 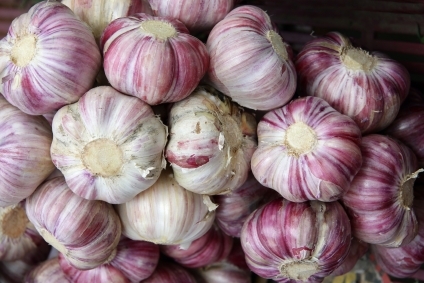 Native to central Asia, garlic has a lengthy history dating back 6,000 years. 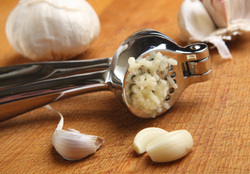 Long a staple of Mediterranean diets, garlic was a commonly used seasoning in the cuisines of Africa, Asia and Europe. China is currently the world’s biggest producer of garlic followed by India, South Korea, Egypt and Russia. Regarded as a force of both good and evil, the Egyptians are said to have fed the herb to workers building the Great Pyramid of Giza because they believed it boosted their stamina. In the Middle Ages, plague-phobic Europeans ate whole cloves of garlic to fight off the scourge known as the Black Death. Known as nature’s wonder drug, garlic is recognized for its wide-reaching medicinal properties, in the treatment and prevention of disease. It has been credited with extending human longevity, preventing certain cancers, lowering cholesterol levels, reversing high blood pressure, resisting the common cold and overcoming fatigue. The herb, which can also be deemed a vegetable too, is rich in protein, vitamins A, B-1 and C and contains essential minerals such as calcium, magnesium and iron. It also contains 17 different amino acids. Dubbed the ‘stinking rose’ because of its overpowering taste and smell, garlic is known for causing bad breath, which apparently can be neutralized by sipping milk or eating parsley. Ironically, despite its illustrious reputation, the herb that causes garlic breath has also long been admired for its powers as an aphrodisiac. Legend has it that Tibetan monks were forbidden from entering monasteries if they had eaten garlic because of its reputation for arousing sexual desire. Thanks to Hollywood and popular literature, we’re well aware of the myth that garlic deters vampires, but it’s also thought to protect against the evil eye and to ward off jealous nymphs said to terrorize pregnant women and engaged maidens.